"Hotel Transylvania" was a movie that really surprised me when I rented it in 2013. I thought it was a clever way of introducing the Universal Monsters to a younger audiences, it was equally clever in the way it played with the tropes of these characters that have defined their movies for years. It also had something to say about family and relationships, deeper meanings that are sometimes hard to come by in family films. I was also surprised that it featured the voice talent of Adam Sandler, Kevin James, David Spade, Steve Buscemi, and Selena Gomez. Who would have known I'd ever love a Selena Gomez movie? I was looking forward to this because of how good "Hotel Transylvania" was and I was hoping for another winner. "Hotel Transylvania 2" opens with a wedding. Drac's (Sandler) daughter Mavis (Gomez) is getting married to her human boyfriend Jonathon (Andy Sandberg). Soon after their marriage they have a child together, and Drac is hoping that his first born grandson will have vampiric powers. It seems that it is not the case, at least initially. Drac sends Mavis and Jonathon on a quick honeymoon so Drac can focus on bringing the vampire out of his grandson. He enlists the help of Frank (James), Wayne the Werewolf (Busecemi), Griffin (Spade), and Murray (Keegan-Micheal Key). The first film had a lot to say about family dynamic and that is definitely a theme here. The biggest thing you will take away from "Hotel Transylvania 2" is how expectation can creep into families. I think, even if they are big or small, there are certain expectations parents have of their children, and sometimes even their grandchildren. If the children do not live up to those expectations, it can be Earth-shattering to the parents. 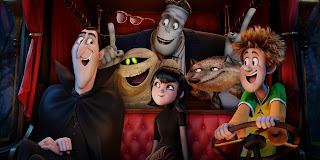 "Hotel Transylvania 2" definitely dissects that, as Drac loses hope that his grandson may not be a vampire, and how that drives a wedge in the relationship with his daughter. Mel Brooks shows up, providing the voice for Vlad, Drac's father who also has strong feelings of his great-grandson having vampire powers. It all maybe coming from a silly family movie, it speaks volume's about real life and its almost eerie how easily one can identify with the story and characters. The animation is, as expected, lovely. The voice talent by all involved is just as good as the second time around. I think in a different life, Adam Sandler was a magnificent voice actor, and his career was never as tarnished as it is today. Sandler has come up with several goofy voices in his years, but sometimes they never matched his onscreen performances. Sandler was born to be a successful voice actor, I just don't think he ever knew it. I don't want that to sound like I am slamming Sandler's career, because I have enjoyed lots of his live action work, its just his voices that I am really drawn to. Everyone else does really exceptional work here. After coming off an animated film that did so much, I think I expected the film to be more funny than it was. "Hotel Transylvania 2" seems to play it safe in the humor department. If families plan to bring their kids to this after a long day at the office, I am afraid they will end up tuning most of it out instead of enjoying it with them. I know on this blog, I am often hard on family films for not always appealing to the adults. I understand that these movies are mostly geared towards kids, but what makes a family film really click is remembering that there are several different ages in the audience. I thought the first film had that in mind, and I think its sequel came up lacking a bit. Still, there is still plenty of content to keep people of all ages happy. I hope this is a series Sony continues to play with over the upcoming years. I think with some serious tweaking, it could be one franchise to remember. There is lots of good stuff here, and sometimes its a better movie than it needs to be.